Aura FLV Player, the versatile MPG player, helps you play FLV and YouTube videos, convert MP4, WMV, 3GP, MPEG, VOB, MOV videos to FLV videos, and turn your videos into web flash with playlist, advertise, and flash templates for uploading to social websites like MySpace, our free web album Go2Album, or insert to your own website. With the MPG player, you can now display any FLV videos from website or computer, and create a flash file that contains the FLV videos, or any other videos that converted to FLV videos by the MPG player. Now display and turn your web FLV videos to web flash using the MPG player! Display FLV, MP4, WMV, 3GP, MPEG, VOB, MOV, etc. The MPG player is a web FLV player, and more than just play the FLV videos from PC or website, it can display also many other common video formats like MP4, WMV, 3GP, MPEG, MKV, MPEG1, MPEG2, MOV and more. To display videos in the MPG player, you just need to click the Add button to add videos that are from your computer or insert a URL of a web FLV video. Double click on a video in the main panel of the MPG player to display it in the built-in player. The MPG player is not just a web FLV player, but also a video converter that converts various video formats like MP4, WMV, 3GP, MPEG, MKV, VOB, MOV, etc. to FLV video format. To convert videos to FLV, you just need to add them to the main panel of the MPG player by clicking Add button, or simply drag and drop it. After that, click Convert button to start converting videos to FLV. 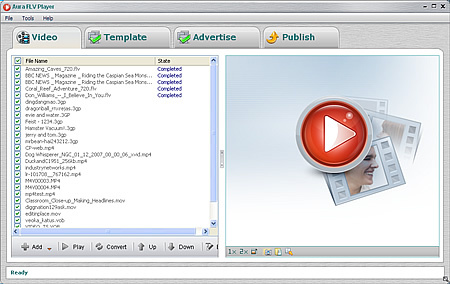 Creating web flash with templates and ads is the main function of the MPG player. It provides abundant flash templates, which enables you to list all FLV videos in. You can choose from 18 kinds of templates for displaying your FLV videos, each template includes 3 different color. It's also possible for you to customize the template properties in MPG player. Go through Customize Properties, here you can see many changeable properties like Basic Properties, which includes movie size, auto play, enable link, auto repeat, background color, etc. ; Panel Properties like button color, slide color, and Video Properties like video left padding, video right padding. Title Properties and Description Properties are also custmizable in the MPG player. Adding advertisement to your FLV web flash is a good way to publicize your product. With the MPG player, you can easily insert and overlay ads to your FLV videos. It's selectable for you to add wether video, SWF, image or HTML to FLV videos as advertisement. Go2Album is our popular used free web album for people to share their web flash with everyone. You can use the MPG player and create web flash, then upload to Go2Album for sharing with your friends, family, and others. Just choose the option Create flash files and upload to Go2Album, then hit the Publish button. The MPG player will ask you for ID and password of Go2Album, which you can freely and easily sign up on our go2album.com. After upload the web flash successfully to Go2Album, you can copy the URL of your flash and tell everyone to share together. Want to insert web flash to your personal website? With the MPG player, you can insert created web flash to your own website and display the FLV videos within a template with ease. Besides uploading to Go2Album, people who owns a personal website will love the function of inserting FLV flash to his own website more. With the MPG player, you just need follow a few steps to embed the FLV flash in your website. How can you insert web flash to your own website: First, add videos to the MPG player. You can add FLV videos or any other supported videos. Double click on a non-FLV video to convert it to FLV, then hit the Template button to choose one template to display your FLV videos. After that, go to Advertise tab to add some ads to your FLV flash if you need. At last, go to Publish tab and choose the first option Create flash files only and then hit the publish button. Wait for the publishing process finishes, click the Open output folder button and open the *.html with notepad. Copy the code from <object> to </object>, then paste into the desired place of your own HTML webpage. Copy the whole produced files of the MPG player to the same folder with your HTML webpage and upload to the web server. Finish! Aura MPG player provides dozens of wonderful templates for you to display FLV videos. Click templates name to watch the showcase. MPG is a file extension for audio and video files using MPEG compression formats. MPEG is video format used for storing movies in a highly compressed and storage efficient manner which developed by Moving Picture Experts Group (MPEG). These files can be viewed by any media player such as Microsoft's Media Player. If you want to change a file association so that your favorite media player opens the MPG file, go into Windows Explorer by right-clicking the Start button and choosing Explore. Next, right-click on a MPG file and choose Open With. Scroll through the list of programs until you find the media player you prefer. Click the check box that will make the media player the new default for opening MPG files. Now let's download the MPG player to display web FLV videos and create web FLV flash!